(Seinfeld voice) What's the deal with blistered shishito peppers? Ingredients’ popularity can wax and wane like a moon cycle. For example, did you know pork belly starred in 87 percent of all restaurant dishes in 2016? Fact. Or take the kale salad, a now-ubiquitous dish that 10 years ago graced only health-food menus and vegan cafés. I can wrap my head around the night-and-day trends of pork belly and kale salad: A few years ago, indulgence ruled, while restaurants have since course-corrected with virtuous, plant-based fare. 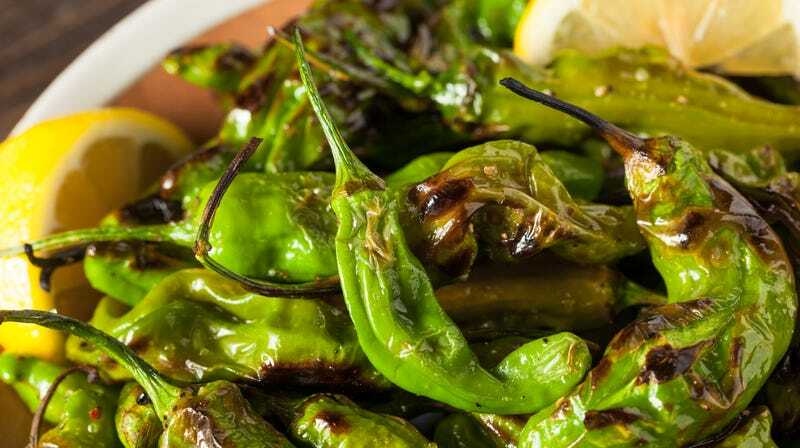 But what explains the rise of blistered shishito peppers, the minimalist, unappetizing side dish—yeah I said it—now served at every American small-plates restaurant? If you like blistered—or charred, or burnt, or grilled—shishito peppers, you’re living in heady times. I’m not telling you not to eat them; if anything, I’m jealous that a dish you enjoy has conquered restaurant menus like a brash Risk player invades Irkutsk. I just don’t understand the appeal nor the reasoning behind the widespread adoption of an appetizer that is simply a bowl of warm peppers. If I’m paying for vegetables at a restaurant—and I do, gladly—then I would like them to be prepared in a flavorful, interesting way: served with a tangy yogurt sauce, dusted with fragrant five-spice, glazed in a floral honey sauce. The most common version of the shishito pepper appetizer arrives at the table with all the splendor of a deflating balloon. Shishito peppers, enjoy your 15 minutes in the menu spotlight. Blistered as you are though, I think you’ve had more than enough time in the sun. I’m ready to welcome our next small-plates overlord. Fingers crossed, it’s some sort of dumpling.